Traditional pressed spear, wrought-iron look in durable, easy-care ornamental aluminum. Available in Residential Series, Residential Series Premium, Commercial Series, and Commercial Series Premium. 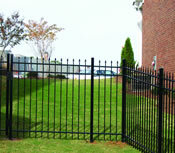 Ultra's Premium grades have a reinforced double-wall rail with hidden fasteners. 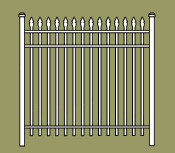 Standard sections are 6' wide x 3', 3-1/2', 4', 4-1/2', 5' or 6' high. Sections come fully assembled. Custom width or height sections are available.